Each year, since 2012, FEMA takes a close look at how prepared the nation is at dealing with disasters of all kinds. FEMA does this by issuing a report titled the National Preparedness Report. 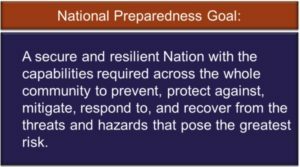 From the 2018 National Preparedness Report Executive Summary “The National Preparedness Report is a requirement of the Post-Katrina Emergency Management Reform Act (cliff notes version can be found here.) This annual report evaluates progress and challenges that individuals and communities, private and nonprofit sectors, faith-based organizations, and all levels of government have faced in preparedness. The report offers all levels of government, the private and nonprofit sectors, and the public practical insights into preparedness to support decisions about program priorities, resource allocation, and community actions.” Preparedness has been a repeated theme over the past couple weeks in FB-ISAO products and alerts as various threats and disasters have had a direct impact on the Faith Based Organizations. The 2018 Report offers 13 key findings that highlight successes and challenges across five core capabilities that have faced persistent preparedness challenges—Operational Coordination, Infrastructure Systems, Housing, Economic Recovery, and Cybersecurity. This year’s report specifically highlights some areas that the faith-based community can bolster in order to improve resiliency and to enhance our national preparedness. Preparedness is an organization-wide, community-wide, and nation-wide effort that requires continuous refinement and improvement. By employing a capabilities-based approach, organizations and communities can build a culture of preparedness that enables them to respond to a variety of threat and hazards, including natural, technological and human- caused incidents. But it is not only setting up an organization and system, effective preparedness also requires continuous reviews and assessments through a lessons learned process that can address shortfalls. FBOs continue to face an ever growing and ever evolving threat making it important for each organization to proactively plan for the impacts can help reduce overall risk. The National Preparedness Report did indicate that in “2017, the DHS Office of Infrastructure Protection Office for Bombing Prevention (OBP) supported 573 counter- Improvised Explosive Device (IED) risk mitigation trainings for more than 10,000 security stakeholders, 12 counter-IED preparedness workshops in high-risk jurisdictions with more than 475 participants, and 381 capability assessments of public safety bomb squads and other operational units. In addition, OBP and FBI partners collaborated to provide dedicated assistance to the faith-based communities affected by a surge in bomb threats.” This highlights the need for Places of Worship and FBOs of all types to continue to prepare to mitigate “lone-wolf” / lone-actor or small group type attacks that involve active assailants or other hostile events, such as use of explosive devices or edged weapons. Preparedness is at the heart, the foundation, of all security and incident response actions. The need for FBOs, especially houses of worship is two-fold; provide better assistance in recovery efforts through more robust and directed coordination with public and private sector partners and to buttress plans that address the continuing and, ever-present, physical threat to individual houses of worship. FB-ISAO issues regular updates on initiatives that address all hazards risk mitigation. Sign up here.